Use Caution When Opening Package And Handling Cutlery. 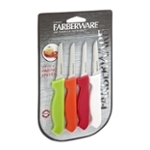 Farberware® Knives Are Extremely Sharp. Keep Sharp Knives Out Of The Reach Of Children.